Alex Epstein ran an OpEd piece on Fox News recently about what he calls the four dirty little secrets of clean energy (the link to his article is at the bottom). I want to use this space to refute what he said. Dirty Secret 1: If “clean energy” were actually cheaper than fossil fuels, it wouldn’t need a policy. Mr. Epstein’s claim that the free market would naturally allow cleaner energy resources to rise to the top if they were truly profitable is absurd. His over simplified supply vs. demand model of economics would have to assume that all energy resources are regulated equally and fairly. They are not. For example, the coal industry over the past years has successfully manipulated regulators to define the lifecycle cost of production in a way that hides many of the real costs of coal. Currently, coal is considered to be the cheapest energy resource in the US, but according to Harvard professor Dr. Paul Epstein (no relation to Alex) in an article published in the Annals of the New York Academy of Sciences, an accountability of the full lifecycle cost of coal would add another 17.8 cents per kWh of electricity produced. This would make coal the most expensive resource of all. We’ve known for a long time that coal is a costly and deadly energy source. In “The Toll from Coal,” The American Lung Association found that coal-powered electricity alone caused “over 13,000 premature deaths in 2010, as well as almost 10,000 hospitalizations and more than 20,000 heart attacks per year.” This was just in the US. The coal related death, illness and injury rate in China is much higher. As I’ve written in a previous article, Behold the face behind the curtain of “clean coal,” coal production has completely destroyed 470 mountains in the Appalachians in just my lifetime. These mountains have completely vanished. There is no accountability for this destruction of land in the pricing of coal. Neither is there an accounting of the cost of communities that have been destroyed by toxic waste, families and businesses that have had to be relocated, and ground water pollution as the result of mining operations. 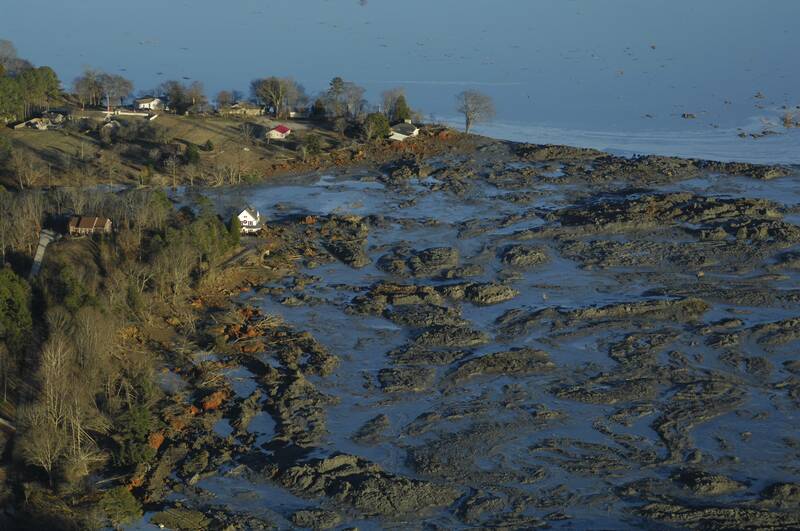 A flood of coal ash slurry from the Tennessee Valley Authority's Kingston Fossil Plant Dec. 29, 2008 in Harriman, Tenn. An earthen dam holding a containment pond broke Dec. 22, 2008, unleashing a billion gallon flood of toxic sludge into the Emory River. Currently, the wind energy industry does take into account the entire lifecycle when calculating the cost of energy — even including CO2 emissions for factories that produce turbine parts, and decommissioning of the wind farm 20 years into the future. No one accounts for the cost of the future decommissioning of a coal plant when calculating the cost of coal energy, and oil and gas companies leave their obsolete old rigs and drilling platforms behind to rust into a heap. Such accounting isn’t evenly applied across all resources. If it was, the cost comparisons would look very different. Federal regulators need to create an even playing field for all energy resources. I’m not advocating a tax on carbon, but it’s a fact that the regulatory structure is severely broken for all energy resources and it needs to be fixed. Dirty Secret 2: Clean energy advocates want to force us to use solar, wind, and biofuels, even though there is no evidence these can power a modern civilization. Denmark was the first country to achieve 20% of its energy production from the wind. Other countries are following Denmark’s example. Scotland expects to achieve 100% of energy production from renewables by 2050. Germany is in the process of shutting down 17 nuclear reactors and plans to replace them with offshore wind farms — construction is already underway. The UK plans to install more than 8,000 wind turbines in the waters of the North Sea. The only excuse the US has for not being able to power our civilization from renewable energy is that our federal government stands in the way. Our legislators have created no less than 36 oversight committees who have to be given a say in anything related to energy policy. These committees find it very difficult to agree on policy, yet they will all agree that their first priority is to satisfy their own party’s political interests. Exacerbating the problem is our American society’s unwillingness to allow turbines and transmission lines to be built within sight of anyone. These pressures drive votes and votes drive the system. Is it any wonder why Europe and China are leading the green energy economy? Dirty Secret 3: There are promising carbon-free energy sources–hydroelectric and nuclear–but “clean energy” policies oppose them as not “green” enough. I don’t believe there are green energy policies that stand in the way of hydroelectric energy. We have been using hydroelectric power plants for many decades and they work very well. Unfortunately, all of the locations where there is enough water running far enough downhill to produce utility scale electricity have already been tapped. There are no more candidate locations for additional hydro power plants in the US. Nuclear energy is clean when it is running safely, and it is very very dangerous to people and to the environment when it is not. But regardless, nuclear fuel is not renewable. It is mined in much the same way that coal is mined. Many of the true costs of nuclear energy are hidden in the toll on human health and the environmental impact of deep earth mining. Dirty Secret 4: The environmentalists behind clean energy policy are anti-energy. Mr. Epstein is wrong in the way he portrays wind and solar as being more harmful to the environment than conventional energy. He claims that “Huge, 400-foot tall wind-turbines with 150-foot blades and noise known to cause unbearable headaches a mile away do not exactly embody the environmentalist ideal of living in harmony with nature.” I couldn’t disagree more. As Vice President of Technology for the world’s largest wind turbine manufacturer, I have stood at the base of operating wind turbines, talking with colleagues using a normal voice while the slow, quiet “whoosh….whoosh….whoosh” emanated only a few meters above our heads. It would be impossible to hear a wind turbine more than a few hundred yards away, much less cause unbearable headaches a mile away. That’s just plain rubbish. As for land use, wind turbines are typically installed in agricultural areas and share the land with farmers and cattlemen. A wind turbine requires less than an acre to produce more than 3 MW of electricity — enough to power 1,500 homes per year. Much of that same acre can also be used for grazing cattle or growing crops. This dual use helps to raise the property value for the land owner. Unfortunately, the same can not be said for solar energy. It takes about four acres of solar panels to create 1 MW of electricity and the land can not be used for anything else. This makes it difficult to put solar power plants near population centers as the land value is too high to have it locked up with rows of solar panels. Roof-top solar panels make a lot more sense in urban areas, and I am delighted to see so many solar panels being installed on top of people’s homes and commercial buildings. In spite of all the complaints and challenges raised by green energy antagonists, the world is embracing clean energy — indeed, they are demanding it. Renewable energy technology is mature enough now (at least in wind and some applications of solar) that it could easily provide clean energy at a competitive price if federal regulations were fairly applied. It is imperative that the governments of the world begin the hard work of putting meaningful, fair regulations in place that will allow green energy to compete. It is up to us, consumers and voting citizens, to put pressure on our elected representatives to make these changes. ← Why should you subscribe to your utility company’s “100% wind energy plan”? The human cost in illness, injury, and death for coal, nuclear, and oil & gas cannot be given a dollar amount. However, it surely should be. Meanwhile, it would be a lot easier for those of us with a social conscience to make good decisions for the good of our planet if only we could cut through all the misinformation out there. Thanks for making a great start at that, with this blog.